I stood in the Milwaukee Art Museum confused. I stood looking at a painting of the inside of an old Gothic cathedral. The art was good, the depiction accurate, but something wasn’t right about it. It didn’t look like a church. It looked like a train station. The artist was Hendrik Cornelisz van Vliet. 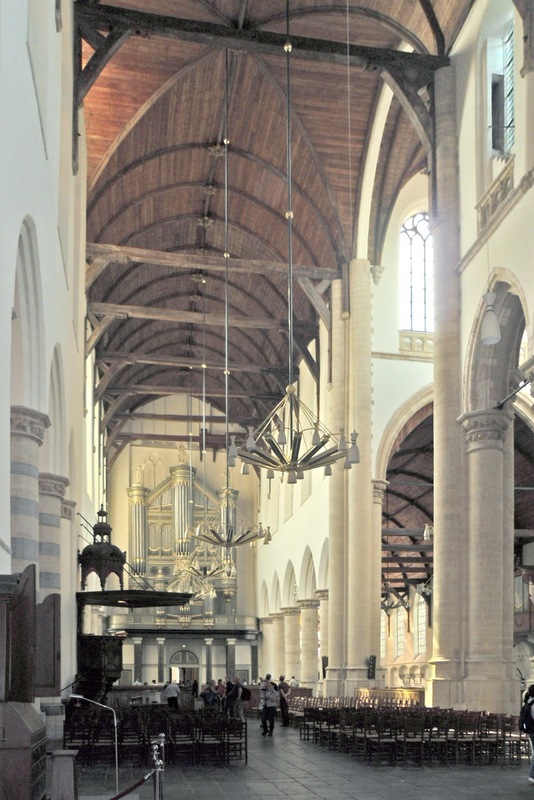 The painting was of the Old Church in Delft. I had been inside enough churches to recognize the raised pulpit towering above the open space. It was definitely a church. But still I was confused. Where were the people supposed to sit? Here and there, in the painting, groups of two and three people stood talking as though they’d happened upon each other in passing—as though on a sidewalk or in a town square. But here they were indoors. “Where are the seats?” I wondered. 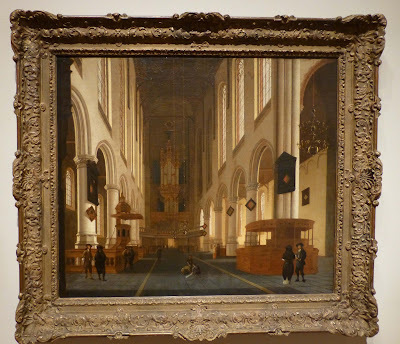 Van Vliet painted the scene around 1670, the Dutch Golden Age, and by that time the Old Church at Delft was already indeed “old”—it had been standing for over 400 years, since 1246. I continued looking at it uncomprehendingly. How could any church function in what was more like a train station than a cathedral? I couldn’t make sense of it. “Throughout most of the history of Christian worship . . . . there were no pews or chairs. Not until the fourteenth century did seating gradually encroach upon the open space where the congregation stood and walked about during worship. Until that time, the people were on their feet and could go where something was happening . . . . The congregation was mobile and the interior of the church was not regimented into fixed rows of inflexible pews. “In the late Middle Ages the congregation sat down on the job and there was a drastic change in Christian worship—perhaps the most important in history. People, in effect, became custodians of individual spaces which they occupied throughout the service, and social distinctions made some spaces more privileged than others.” (Church Architecture, 11-12). In other words, for the first fourteen centuries of Christianity, people stood throughout the worship service. I was astonished. Or as the then-new King James Version would have put it: “astonied.” I had never heard this fact. Where exactly did the congregant walk to? What did they have to move around to see? Indeed, why did they have to move at all? I couldn’t understand really how a church service would function like this—without chairs. It seemed haphazard, disorderly. But for the majority of church history, there were no chairs in the sanctuary. Clearly, the church we know today has changed. Worship itself has changed. Church practice has changed. And chairs have been part of it. Then I began to wonder just what did these changes look like? Church Architecture had already pointed out a couple aspects: The church space became more fixed, more controlled, “regimented.” People’s habits became more fixed, less fluid. But something else happened. Something unexpected. With pews came the social classes. The social hierarchy from out there became the social hierarchy in here. Whereas before people constantly mingled in an ever-shifting, always-moving group, now, with seats, people began to distance themselves from one another. Given a more controlled space, people asserted their rights and privileges for the better seats. With it, equality began to break down. We experience similar dynamics in two modern venues: in a stadium and at a concert in a bar. At a sporting event, the wealthiest people generally buy the best seats closest to the action. But at a concert with standing room only, everyone pays the same price and stands wherever they can find space. There's no preferential treatment being governed by the furniture. Today, churches are more like stadiums. In reaction “free churches” eliminated pew rents and rejected the authorities that enforced them. Eventually, many churches eliminated their pew-rent practices, some even going so far as to remove the pews themselves. They had rightly identified the culprit. They finally understood the meaning of chairs. The injustices that came with pews show us how much influence a technology can wield when we thoughtlessly adopt it. Who would have imagined that a few pieces of furniture would reinforce the class system? Today, segmentation still happens. People still tend to sit in the same general locations each Sunday. But the class conflict has diminished more or less—the pews have been better integrated. But it took a few hundred years. 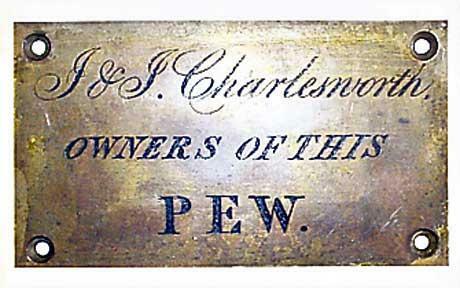 It took a few hundred years before the injustices of pews were acknowledged and put right. Today, with the technologies we’re installing, chairs seem benign. And as our technologies become more powerful, the extremes can run further and their impacts deeper before we see well enough to reverse them. Who knows what effects they will have had by then. What will it mean for churches that inhabit theatres, stadiums, malls, or store fronts, or communicate primarily via email, Twitter, Facebook, and other social media, or purchase land that you can only get to by car? What will it mean for churches that are too big to fail, have cavernous spaces that require massive sound systems, or use large screen projectors to function each Sunday morning? These are not mere pieces of furniture. Church practices are changing faster than any pastor can discern. If it took a few hundred years to understand the meaning of chairs in church, how long will it take to understand the meaning of these seismic innovations? Many of these innovations could never have come about, though, if it we hadn’t first installed chairs. Why? Because the biggest changes weren’t physical. They were psychological. People began to think of themselves differently. They were no longer participants; they were observers. Without chairs, they had been actively involved and engaged by moving along with each element of the service, but as they sat down they became passive viewers—spectators in an audience. The service became something to watch. This is key to today’s church practices. Today, churchgoers are often treated more like moviegoers, even by the pastors who are planning and preaching. Churchgoers walk in, sit down, and watch a program, a performance. Many church critics complain that churches are providing entertainment, not worship. Churches are criticized for catering to a consumer mindset—but part of the problem isn’t the mindset, it’s the furniture. And because churchgoers are no longer ambling participants, but seated spectators, the shift toward video campuses is acceptable, sensible, and even logical. It’s simply one more step. With a video screen, spectators can watch without participating. But actually, the change is even more radical than that. It’s not that they can watch; they must watch. It’s not that they don’t participate; they can’t. Chairs made watching possible, but video has made it mandatory. Before chairs, everyone participated; after video, no one participates. And, likely, none of this would have happened without first putting pews in church. Van Vliet’s Old Church at Delft, or “Oude Kerk” as it’s called, still stands in Delft, the Netherlands. But much of the open floor plan has been cluttered with chairs. They’re not quite the stationary pews that many later churches eventually installed. They are folding chairs. Nonetheless, the starched straight rows still look a bit out of place beneath the plunging chandeliers and stone columns. The chairs look like boy soldiers in a city of men. They fail to define the space or how one should move in it. They look, simply, like they are in the way. Church Pews, Their Origin and Legal Incidents with Some Observations on the Propriety of Abolishing Them, in Three Chapters, by John Coke Fowler, Esq.